"Positive Morals Mitigated by Some Magic"
THE KID WHO WOULD BE KING is a fun, heartwarming fantasy adventure movie that takes the legend of King Arthur and the Sword in the Stone, and sets it in modern time centered around children. THE KID WHO WOULD BE KING is a charming, creative spin on King Arthur folklore, with some very positive moral messages mixed with some occult magic and adventure violence, so caution is advised for older children. 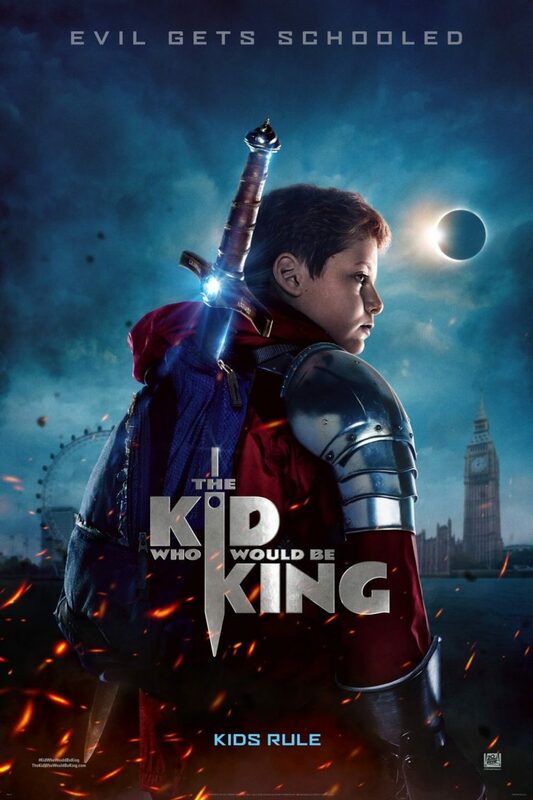 THE KID WHO WOULD BE KING is a fun, heartwarming fantasy adventure movie that takes the legend of King Arthur and the Sword in the Stone, and sets it in modern time centered around children. There’s a lot to love in the movie, but a couple key elements require some caution. The movie opens with the narrator explaining the story of King Arthur. England was leaderless, and at war, with various people vying to take control. One man, Arthur, was noble enough to wield the magical sword Excalibur and with it was able to unite the land. He was a good king, who lived by a code of chivalry, but his sister Morgana was greedy, and turned to dark sorcery, hoping to steal the sword and the throne. Of course, King Arthur defeated her, and she was forced into hiding, but she vowed to return to the surface when men were once again leaderless and divided. Cut to present day London. Alex is a young boy, who along with his chubby best-friend Bedders, is consistently bullied at school. Alex lives with his single mother and longs for some sort of connection with his father whom he’s never met, but whom his mother describes as a good man. One day, Alex runs away from bullies to a construction site where a building is being torn down. There he finds a sword sticking out of a piece of concrete. With one strong pull, he’s able to pull the sword out of the stone. The next day, Alex and Bedders inspect the sword and find Latin written on it. They discover that the sword is Excalibur, the sword of King Arthur. Well, that’s what the sword seems to imply, but that’s ridiculous to them because they think King Arthur and the Knights of the Round Table are just a story. That night, however, a skeleton demon rises from the ground and tries to kill Alex. Merlin, a magical ancient wizard whose taken on the form of a teenage boy arrives just in time to save Alex. Merlin explains to Alex that he’s been chosen to save England from impending doom in a matter of days because he’s the only one that could have pulled the sword out of the stone. He has a few days to find some knights he can trust that’ll help him go to Morgana’s turf and kill her before she rises to destroy and enslave humanity. The only problem is that Alex is just a child. He doesn’t know anything about fighting undead creatures, much less being a hero. With the help of his friend, Bedders, Alex sneakily knights two of the school bullies to help them on their mission, because they’re bigger and stronger than they are. Can these four kids rise to the occasion and save England? THE KID WHO WOULD BE KING is a charming, creative spin on King Arthur folklore, with witty dialogue, a fast-paced plot and near perfect emotional beats for the characters. The young cast led by Louis Serkis (son of actor and director Andy Serkis) as Alex is terrific. Director and writer Joe Cornish expertly uses “fish out of water” humor, particularly with the awkward, but adorable Bedders who turns out to be the movie’s heart and humor. As the stakes grow greater in the adventure, the emotional jeopardy increases as well, leading to an epic battle between an army of sword-wielding children and flaming skeletons that are both exciting and humorous. The worldview in THE KID WHO WOULD BE KING is predominantly moral and biblical, though a major part of the plot involves sorcery from both the good guys and the bad guys, so the movie has some mixed elements. Alex and his friends, including his former enemies who become friends, must learn the chivalric code in order to defeat the evil Morgana. Even though the code of chivalry historically is combined with faith and service to God, this movie makes the code simply about being kind, truthful and courageous, which are all, admittedly, noble and moral attributes. The heroes also learn to love their enemies. The villain is called greedy and tries to destroy the faith of the four children by preying on their weaknesses. Ultimately, Alex learns that one isn’t worthy of wielding Excalibur because of one’s family lineage and coming from greatness, but instead, you can be worthy by being noble and uniting people instead of dividing. A message like that is worth applauding. At two other points, people exclaim “thank God,” and in one instance it’s clearly a prayer. Of course, as we noted above, the movie contains some magical elements. At one point, Bedders learns some magic himself that he learned from Merlin. There’s not any explanation as to the source of the magic, but it’s definitely dark, and they’re not afraid to call it sorcery. THE KID WHO WOULD BE KING also contains lots of action violence. The children are in real jeopardy throughout the movie, and the bad soldiers they fight are fiery skeletons, often on horseback. Morgana is a grotesque witch who transforms into an even more grotesque dragon. The movie is absolutely not for young children, regardless of the PG rating. Because of these elements, MOVIEGUIDE® advises caution for older children when it comes to THE KID WHO WOULD BE KING. Child directly disobeys his mother, and a father abandoned his family. THE KID WHO WOULD BE KING is a fun, heartwarming fantasy adventure movie that takes the legend of King Arthur and sets it in modern times centered around children. Alex is a young boy who’s always getting bullied, along with his best friend. When Alex finds a sword sticking out of a rock in a construction site, he pulls it out, only to discover it’s Excalibur, the magical sword of King Arthur that only one noble person can wield. Alex and his friend are then thrust in a battle to save England from King Arthur’s evil, sorcerer sister, who wants to enslave all humans. THE KID WHO WOULD BE KING is a charming, creative spin on King Arthur folklore. The worldview in THE KID WHO WOULD BE KING is predominantly moral and redemptive, with strong themes of honesty, courage, kindness, chivalry, loyalty, and doing the right thing. However, a major part of the plot involves sorcery from both the good guys and the bad guys, so the worldview is mixed. This, along with some moderate action violence, requires a caution for older children.